Clemson and Alabama both have high-profile quarterback dilemmas, but Dabo Swinney has taken a different approach to how he handles questions compared to Nick Saban. According to Mike Barber of the Richmond Times-Dispatch, the Clemson coach said he understands why there are constant inquiries about Kelly Bryant and Trevor Lawrence. Clemson coach Dabo Swinney gets it. Asked if he gets annoyed by two questions about having two QBs: "It'd be crazy not to ask me about it." Saban, on the other hand, caught national ire for yelling at ESPN’s Maria Taylor following an innocuous question post-Louisville. The Alabama coach has continued to keep any plans involving Tua Tagovailoa and Jalen Hurts closely guarded. But these aren’t national secrets. Swinney has acknowledged that both Bryant and Lawrence — who threw a 64-yard touchdown on his first attempt at Texas A&M — are playing well. They’re going to continue sharing snaps until one quarterback separates himself. In the college football world, that is hugely important news. Beat writers are simply doing their job asking questions about who will be leading the offense. 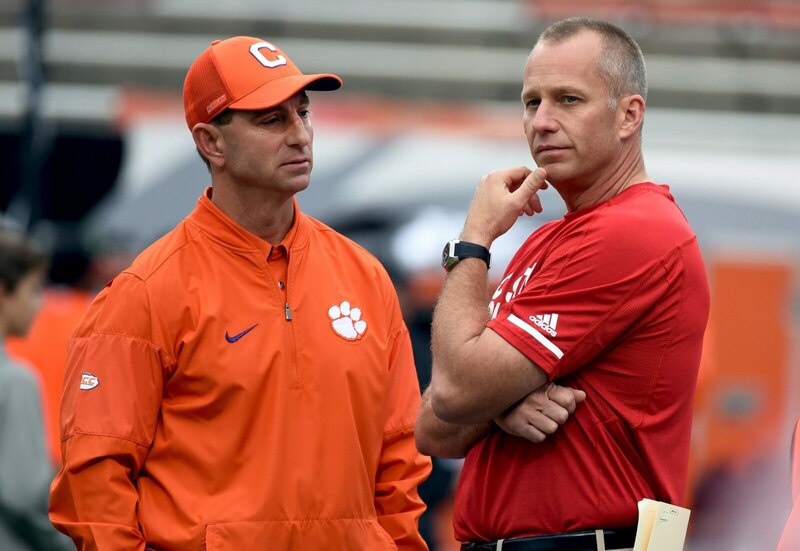 There’s no good reason for coaches to not respond like Swinney.